Pay particular attention to the design phase of the project. Limit horizontal projections, sills, and tops of walls and waterproof those required by the project design with elastomeric coatings. Give special attention to the design of parapets. Cross reference the appropriate specifications sections in Division 4 on masonry construction (typically Section 04 22 00 Concrete Unit Masonry) with those in Division 7 on water repellent treatments (typically Section 07 19 00 Clear Water Repellents). Specify pre-installation meetings to familiarize all parties with the intended methods for prevention of water penetration. The masonry materials, construction, water repellent treatments, and treatment at joints should be discussed along with the expected results and testing procedures. Encourage the use of samples and mockups of masonry construction with the proposed water repellent treatments. Test the mock-ups for water repellency. Mock-up panels should be a minimum 5 ft. by 5 ft. panel and testing should be for at least two hours. Control joints and joint sealants should be included in the mock-up. Tests should be based on the Navy Hose Stream test or a similar field hose stream test. Ensure the use of full shoved head and bed joints (mortar for at least the thickness of the face shell of the masonry unit), if necessary through the use of third party inspections. Specify double struck joints for exterior masonry construction. Require beeholes visible from 5 to 10 feet to be filled by a qualified mason prior to application of the water repellent treatment. Fill cracks that exceed 0.02" in width or 5% of the joint length with mortar by a qualified mason or with joint sealer by a qualified applicator. Apply water repellent treatments in strict accordance with the manufacturer's installation instructions and recommendations, by a trained experienced applicator. Field test the concrete masonry walls after the water repellent treatment has cured to assure water repellency. Require a ten year material and labor warranty from the manufacturer and the applicator through the general contractor. Selecting concrete masonry as an integral part of the building's appearance provides numerous benefits for the designer and the owner. Where the gray color of standard cementitious products might provide a cold appearance, use of integral colors gives concrete masonry a warm appearance. The multitude of concrete masonry textures available provides an almost infinite variety of possibilities for building design. And, cost is typically competitive with other types of construction for many buildings. Applying a clear water repellent treatment to concrete masonry can maintain the appearance of the concrete masonry while providing protection from water intrusion. Additionally, most clear water repellent treatments will keep the concrete masonry looking cleaner longer since a lower permeability prevents dirt from being drawn into the concrete masonry with the water. Projections and Sills. The cells in concrete masonry construction, and the need to maintain alignment of the cells for reinforcing, limit the tendency of designers to create additional patterns by extending some units beyond the face of the wall. Although this process is possible with concrete masonry, the problems of increased water absorption and penetration through the exposed horizontal surfaces should be considered. Most clear water repellent treatments are not designed to resist water penetration on horizontal masonry surfaces. 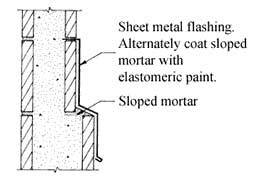 Accordingly, ledges formed by projecting units out beyond the face of the wall should be either flashed with sheet metal or patched with an elastomeric coating (see Figure 1). Dense, precast concrete sills, properly sloped and with drip edges, can provide an acceptable sill condition (see Figure 2). Masonry unit sills should also be coated with an elastomeric coating. Avoid mortar sills since they are porous and crack. If used, they should be covered with flashing or coated with an elastomeric coating to prevent water.